There are 5 reviews of Nirvana White. I was actually just wearing my sample of Bvlgari "Black" before putting this one on, and I'm finding that smelling this perfume is such an enormous relief to my nose! :D I managed to mostly wash the Bvlgari fragrance off (luckily it was only dabbed on with the testing stick, not sprayed) so I am actually getting the smell of this perfume now. I found Bvlgari "Black" far too harsh and aggressive, so I decided I needed to use one of the most feminine scents I own to hide it! :D It's actually worked amazingly well!I will say I've also already worn "Nirvana" a few times before this on it's own, so I do have a pretty good feel for this fragrance now. 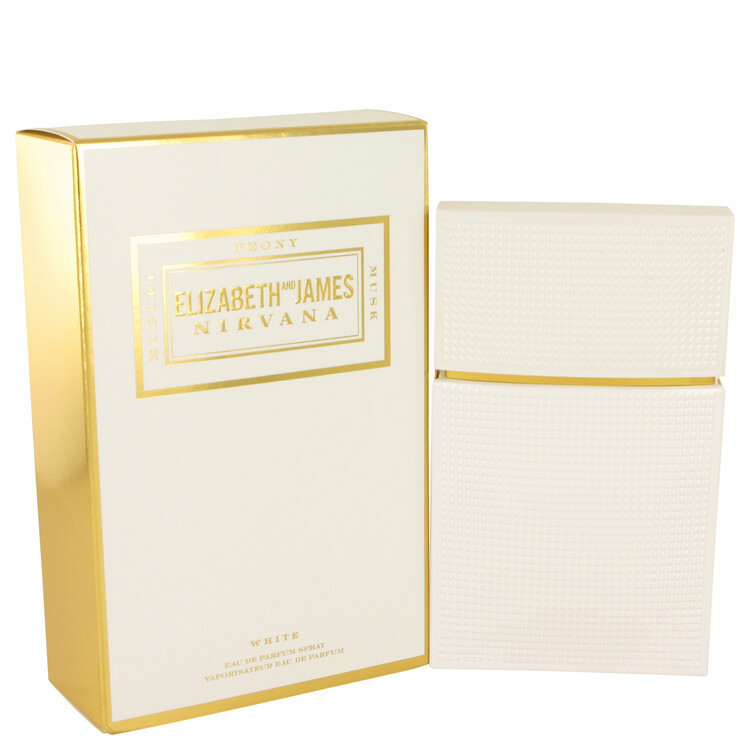 The first thing I want to say about "Nirvana" by Elizabeth and James (the white version) is that it is undeniably a scent that just makes me feel good! Again, it is a dark, dreary, cold, wet November day, and both the weather and the fragrance I had on earlier were making me feel terrible! Then, I washed off the last fragrance and put this one on, and I immediately felt great! That, on it's own, was enough to make me want to rate this perfume five stars! Again, this is, quite simply, a beautiful smelling perfume! It is almost entirely a soliflore, since what you mostly smell in it is the peony note, and it is a very realistic peony scent! This is a perfume that really doesn't seem artificial at all, it's very, very "flower garden." It has a very definite lily-of-the valley note mixed in, but it's in smaller amounts, the peony really dominates. I would recommend this one more to women who are looking for a realistic peony scent, not necessarily a "muguet" one. The other thing I feel I need to mention about this perfume too though is that the projection and sillage are huge! When I actually sprayed this one on from the tester bottle in Sephora I found it overwhelming. However, I ended up getting a small purse-sized roller-ball of "Nirvana" (white) with points I'd accumulated (at Sephora again.) Back in the Summer, when I got it, I was still really on the fence over how I felt with this one. I definitely didn't care for it as much back in the hot weather, even though I still ended up giving it a fair chance and wore it at least three times, once to a wedding! But I could never make up my mind about how I actually felt about it, so I never really reviewed this one. Now, in the colder more depressing weather, I definitely feel a lot of love for this perfume! It definitely has all the sillage I need even from a roller ball version (this is definitely not a skin scent.) And as I said, it also just obviously raises my spirits and makes me feel good. Plus, I've noticed I receive nice compliments when I wear this perfume too, so it really does seem like a good fit for me! Definitely try this one if you're looking for a really nice feminine floral, it's really worth it! I normally don’t like musk, but I can’t smell much musk here. Just the peony and muguet and/or lily of the valley. It is so light and fresh that I can almost smell tea in it. As a big fan of light tea scents, this is one of my favorite florals so far. I was prepared to dislike this one as I am not enamored with the Olsen twins, so I was quite surprised when I squirted this on, went about my business, then caught a whiff and said "Whoa, what is this?" Extremely, fresh out of the shower clean, very simple floral with a musk base. Extremely light, I can't find it offending in the office setting, but nice enough to wear at night. Like most light florals, the longevity is about four hours, tops. I can see it getting lost in the winter woolens, so save this for summertime wear. Very loud peony marching in with citrus at the very beginning. The drydown is better when the peony has softened (being facetious as it is still quite strong after an hour) and the musk is finally allowed to join the show. The weather right now is cold and snowy and hoping for spring so maybe that's why, right now, I enjoy Nirvana White which surprised me since I usually like spicy, peppery, incense-laden perfumes. Overall, not bad but not unique. I would guess this would not be first choice of a perfumista. There are no member images of Nirvana White yet. Why not be the first? Elizabeth and James launch their Nirvana line in the UK, with new scents: Amethyst and French Grey.